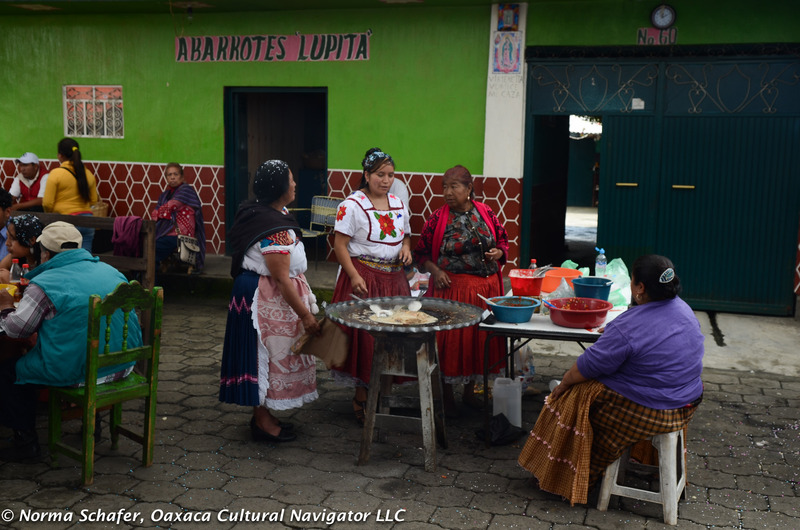 I’ve been back in Oaxaca for almost two weeks, and my mind is still on Michoacan, the last leg of my September journey, and the rebozos woven there. 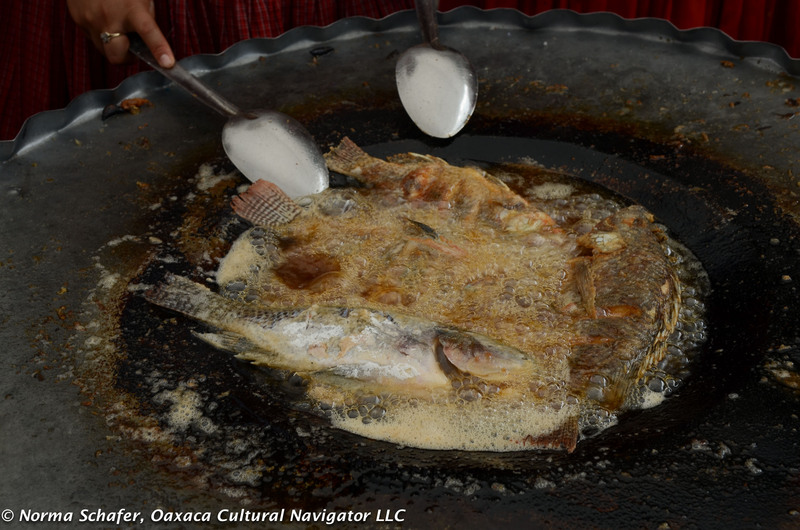 When I came to Oaxaca years ago, I thought it would be the perfect place from which to explore other parts of Mexico, north and south. And so it is. 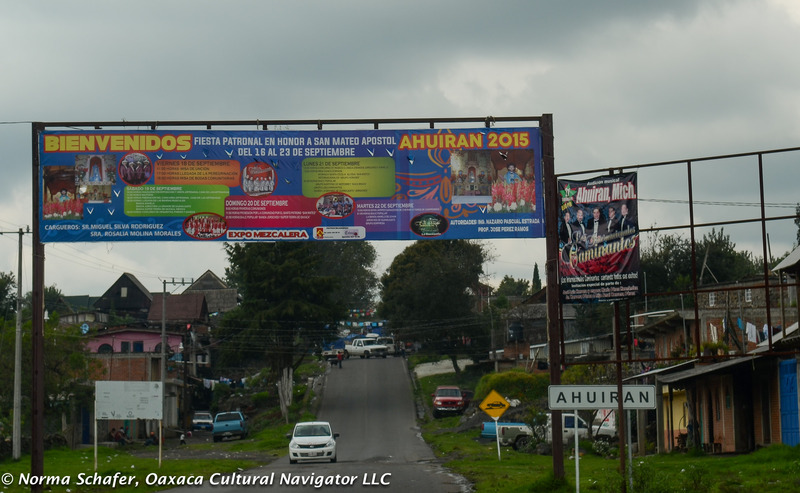 Ahuiran is a small Purepecha village about an hour and a half from Patzcuaro in the Mexican state of Michoacan, high on the Maseta Purepecha (plateau) near Uruapan. 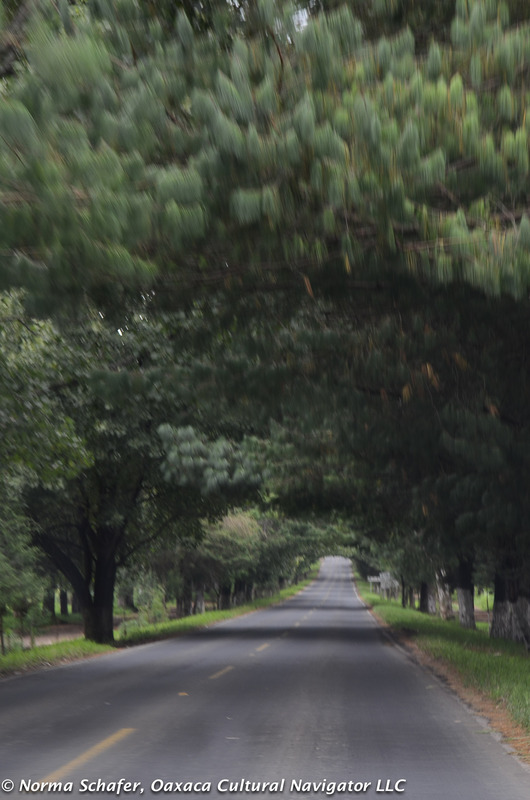 It’s a beautiful drive through fertile farmland, green hills, pastures and tree-lined roads. And, it’s safe. 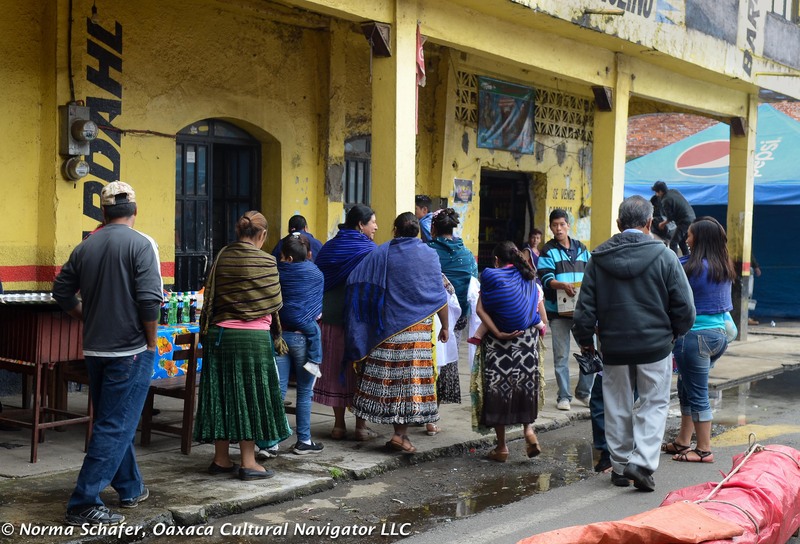 For a complete discussion of Purepecha culture and history, click here. 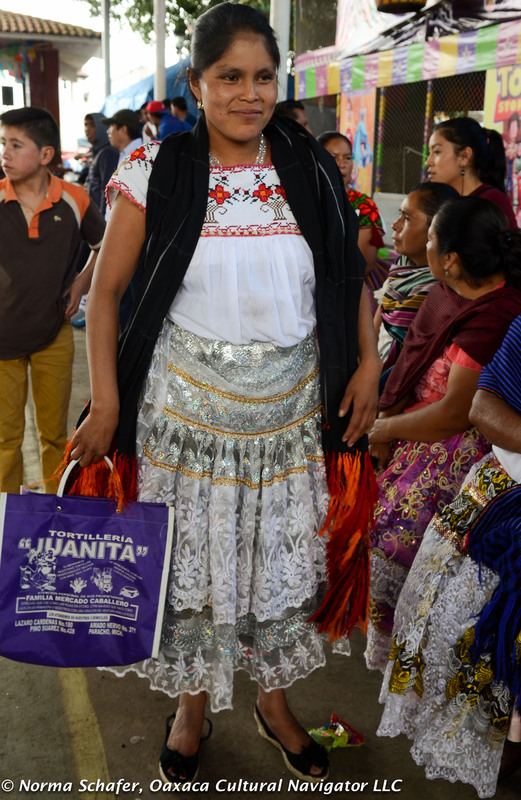 Ahuiran women are famous for their hand-woven rebozos made on the back strap loom. They wear what they weave. 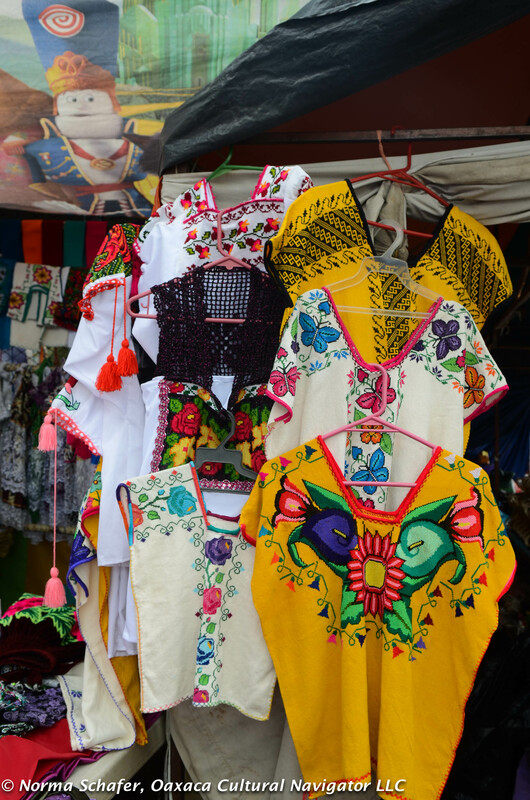 Not many in other parts of Mexico still adorn themselves in traditional traje. 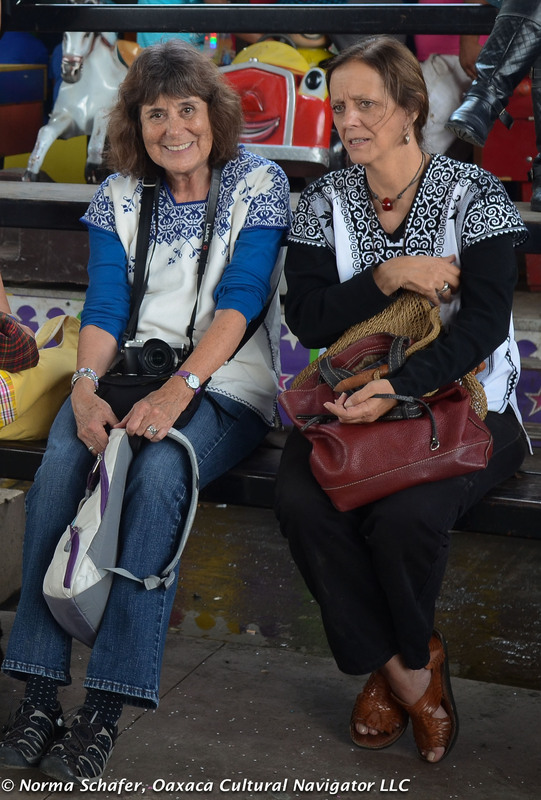 Rebozo-making and wearing is a dying art. This winner has rayon fringe that looks like peacock feathers. 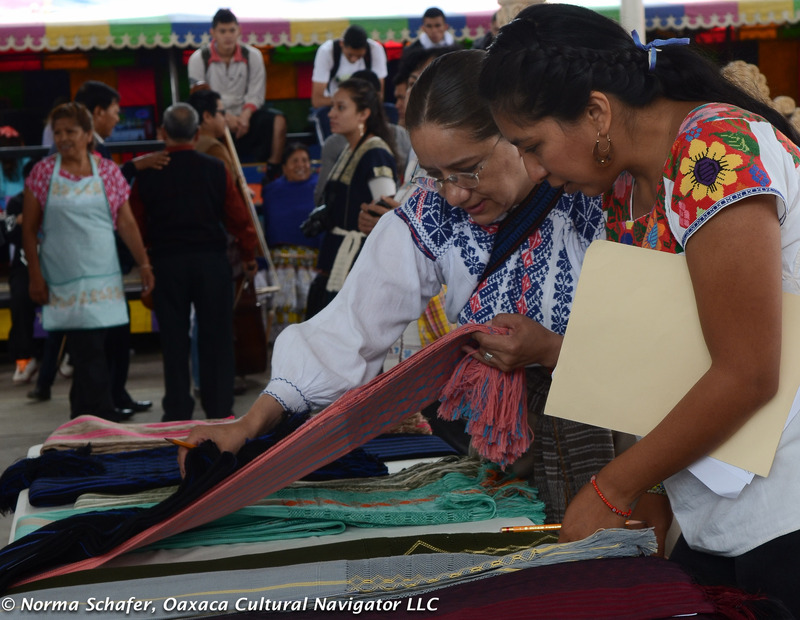 I joined a group of Patzcuaro women friends to go to a rebozo fair, which was really a concurso, or regional competition to select the best of the best. I could not pass up another chance to see great rebozos. I vowed not to buy another. Hah! We discovered this competition was more than rebozos. 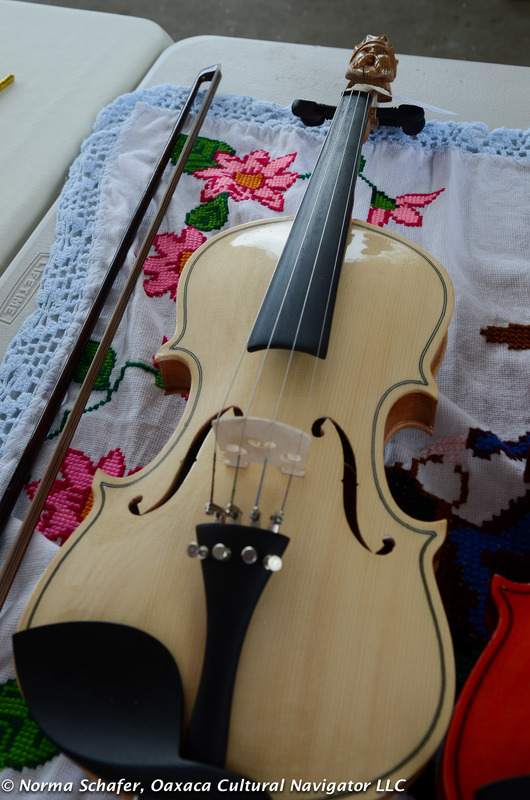 It included wood carving and string instrument making, art forms that are translated to furniture, masks, violins, cellos and guitars. The judges came from Morelia and they took their time to make their selections. Patience is the keyword for being in Mexico. We arrived around 1:00 p.m. and waited. Milled around. Fingered hand-embroidered blouses. Ogled the rebozos that were brought in by the weavers to display for the competition. Watched the passing fashion parade of glittery pleated skirts and flashy fringe. 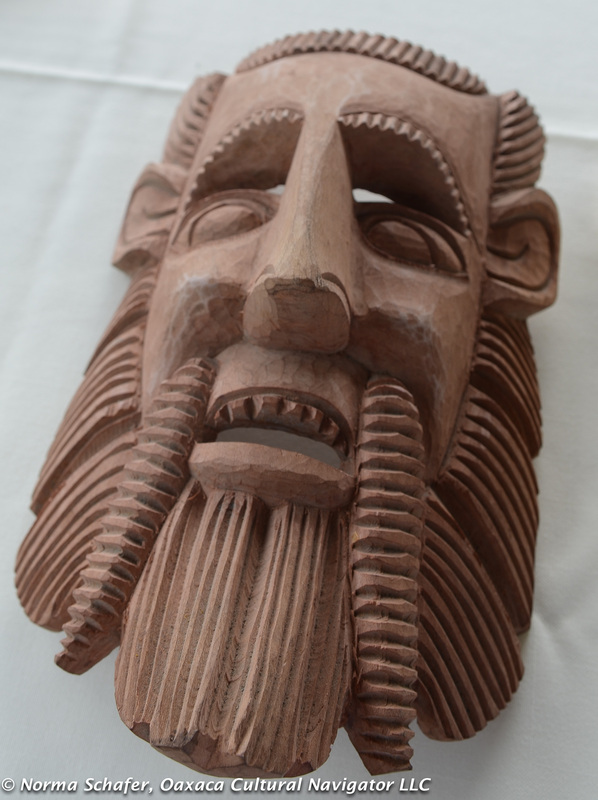 I saw a mask I liked and negotiated a price and bought it long before the judging started. 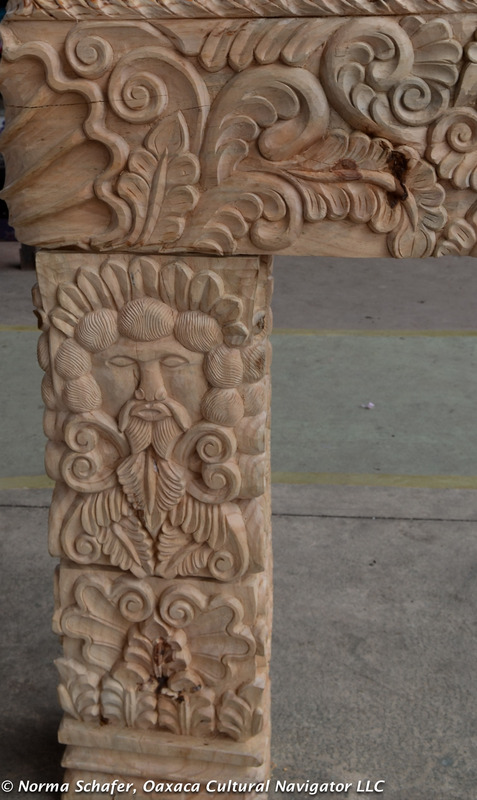 A lovely young man carved it and asked me if I needed a gardner. 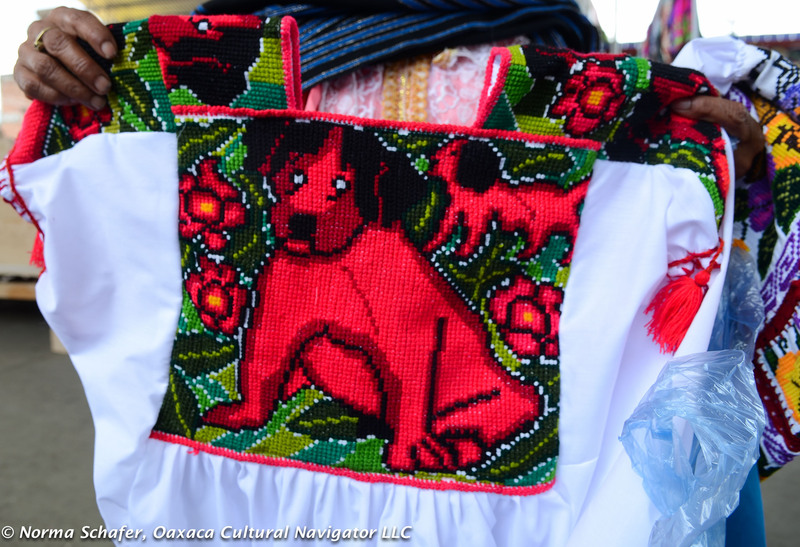 I was assured by the lady who embroidered the animal on this blouse (below right) that it was not a dog but a personal spirit protector. Many women were wearing similar blouses that were finely embroidered. Just not my style. We looked for lunch. I had my eye on the fish sizzling in oil. (I knew it would be well-cooked.) I walked around the mask table a few more times and did the same to take a closer look at the Paracho instruments. Had an ice cream, and waited some more. In Mexico one learns the virtue of patience quickly. 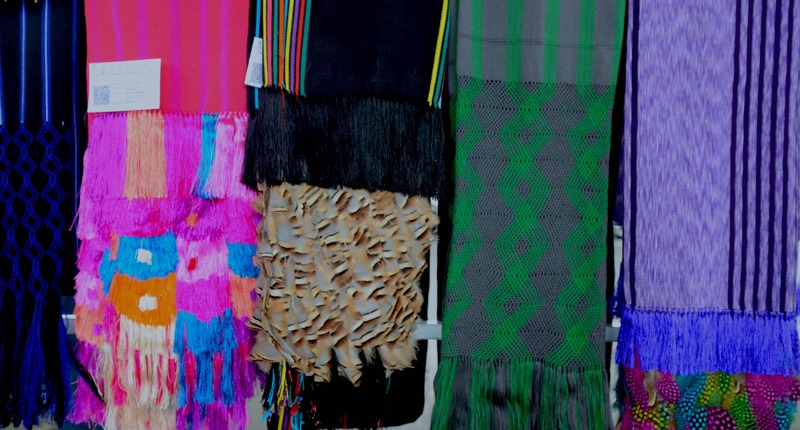 The Ahuiran rebozos are different from the ikat technique found in Tenancingo de Degollado in the State of Mexico. Here, they are heavier cotton. 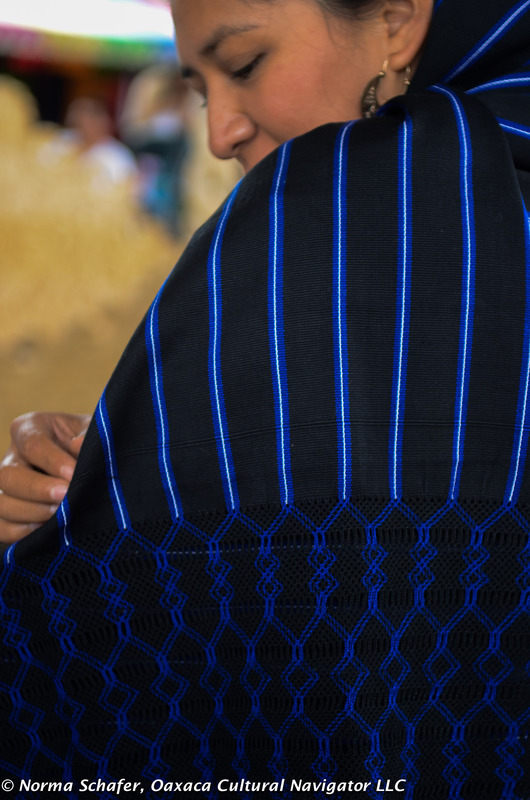 The traditional rebozos are black with blue and white pin stripes. Now, the color palette is extensive and can include lots of shiny rayon. The viewing stands filled up with villagers and I noticed a very regal, elegant woman with an extraordinary embroidered blue and yellow skirt. 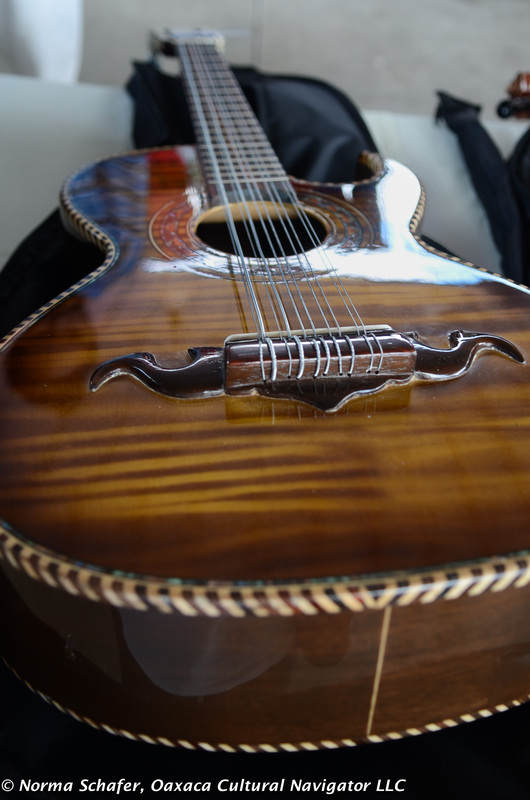 This turned out to be Cecilia Bautista, a Grand Master of Mexican Folk Art. 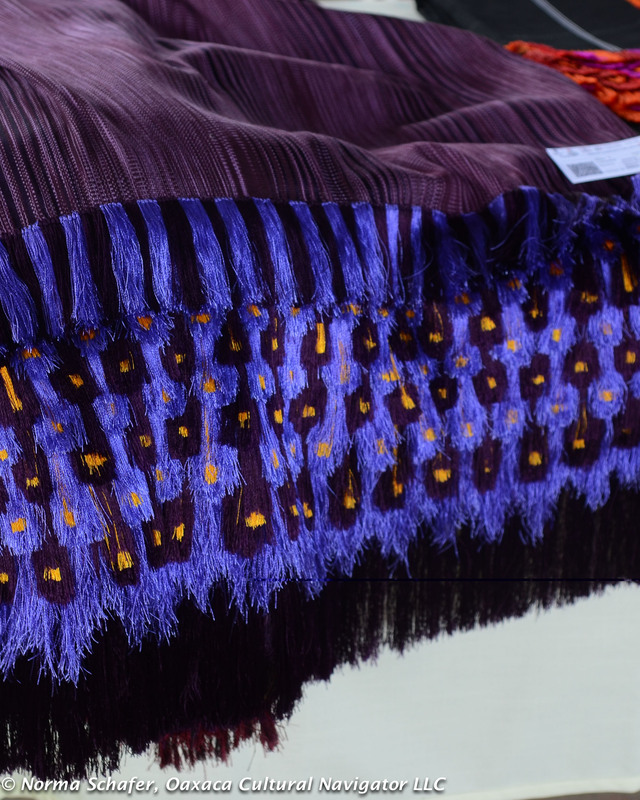 Cecilia is proud that she was the first weaver to experiment with incorporating real feathers on the fringes. 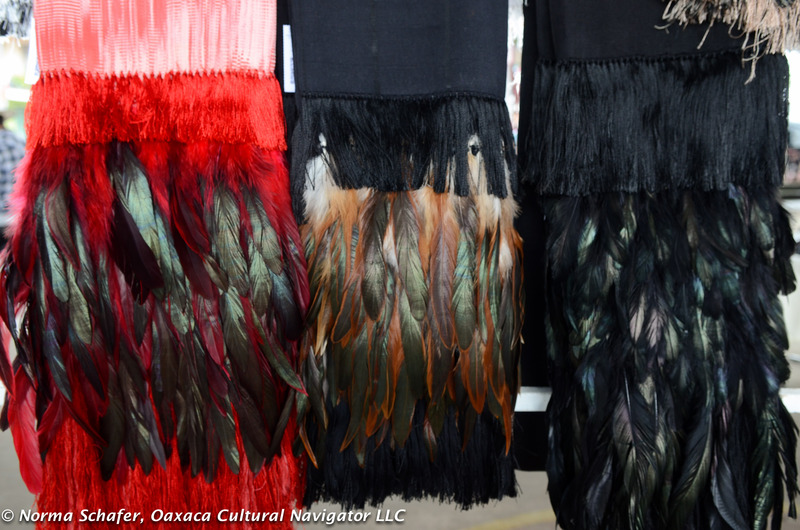 The idea came to her 22 years ago when she learned about feather work done in pre-Hispanic times by her people, the Purepecha (or Tarascans, as the Spanish called them). 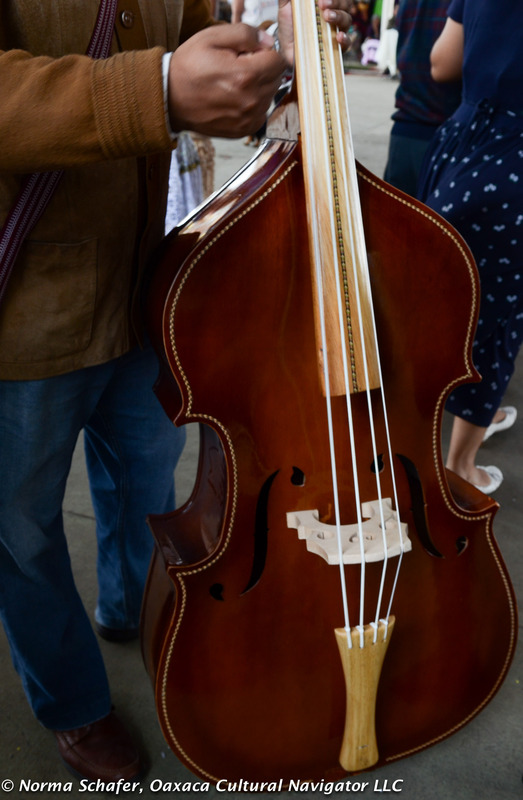 Cecilia’s family of musicians came to entertain the crowd by playing traditional songs on their string instruments, all hand-made. Women came forward to dance, including Cecilia. These are worthy of a major symphony orchestra performance. At 4:00 p.m. the judges were ready to announce the rebozo winners. How did they choose? Density and intricacy of the textile weave. How it draped when they put it on. The soft, silkiness of the fabric. Whether it had a straight edge. The length and technical elaboration of the punta (fringe). There was a special category for puntas that included feathers, too! And the mask I bought got the first place prize in the category! 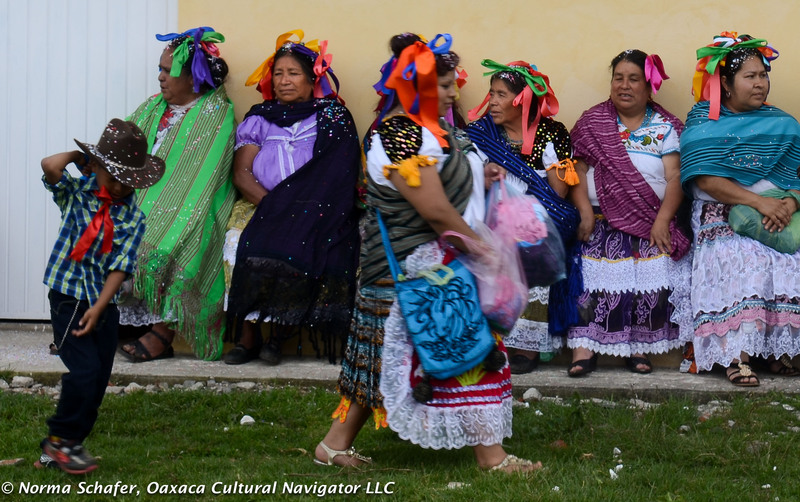 There were six gringas who came from Patzcuaro for this event. 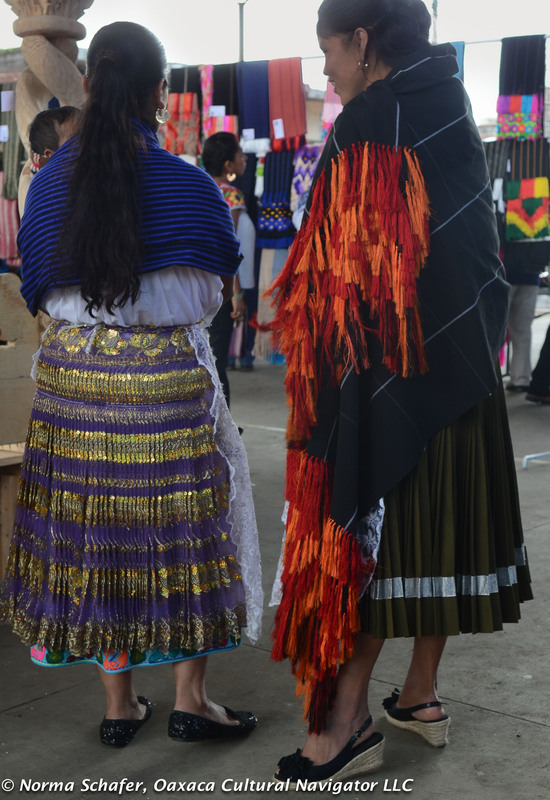 Three of us left with a rebozo, priced between 1,500 and 3,000 pesos. This was a festival day in Ahuiran. There were carnival rides, a special market, lots of vendors, cotton candy and barbecue. 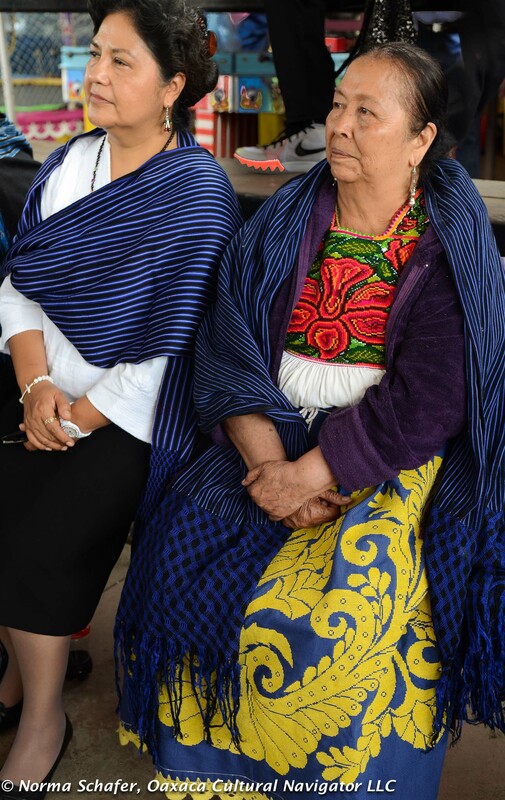 All the women came out in their best rebozos. The wives of the village leaders were totally decked out, complete with jumbo hair ribbons and the sparkliest skirts. The more confetti the merrier. We returned along the same route we arrived on, with volcano peaks on the horizon, men stooping over fields planted with potatoes, Purepecha villages with still a few of the original pre-Hispanic style wood homes called trojes (built without nails) still standing. It was a glorious day. Along the roadside, a spray of wildflowers, mostly cosmos, were coming into their color, necks stretching to the sun, heads waving in the breeze. 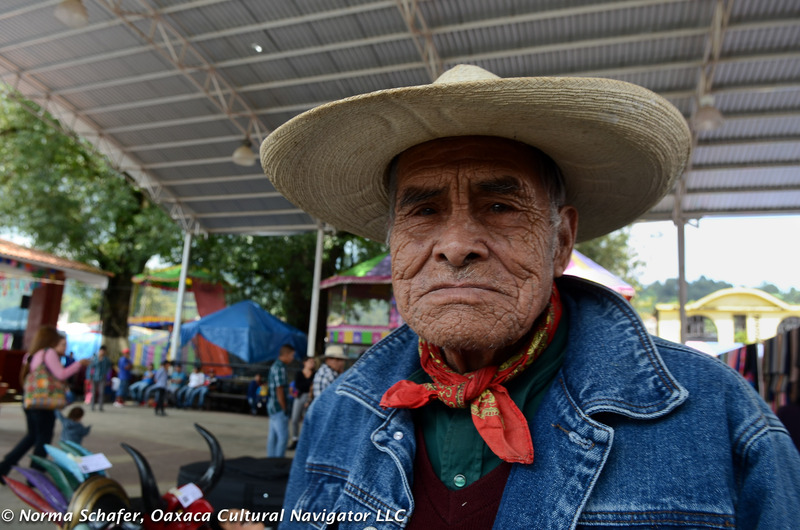 Here in Oaxaca, nights have turned chilly. Days are mild and sunny with a light breeze. We celebrate the Virgin of Rosario with bands, parades and dances. At this moment the firecrackers are booming. Soon, it will be time for loved ones to return during Dia de los Muertos. The cempazuchitl is in bloom. All is well in my world and I hope the same for yours.